Organisations populated by people who have more or less the same mindset they’ve always had will continue to produce more or less the same results they’ve always produced. Breakthrough results happen when people change from a self-focused inward mindset to an others-focused outward mindset. We enable organisations and their people to turn outward through a five-step process: assess, train, implement, re-assess, and sustain. Before beginning the process, we recommend you speak with us about your specific needs, challenges, and objectives. We can help you tailor your approach to leverage the five steps for optimal results. In Step 2, attend world-class training that sparks deep understanding and motivation to change; receive the tools required to improve. In Step 3, apply and practice the tools and insights acquired in the trainings; adjust systems and processes to invite desired changes and help them stick. In Step 4, re-assess mindset and performance using the measures established in Step 1. In Step 5, receive ongoing coaching, consulting, and other support to help maintain momentum and adjust course as necessary. 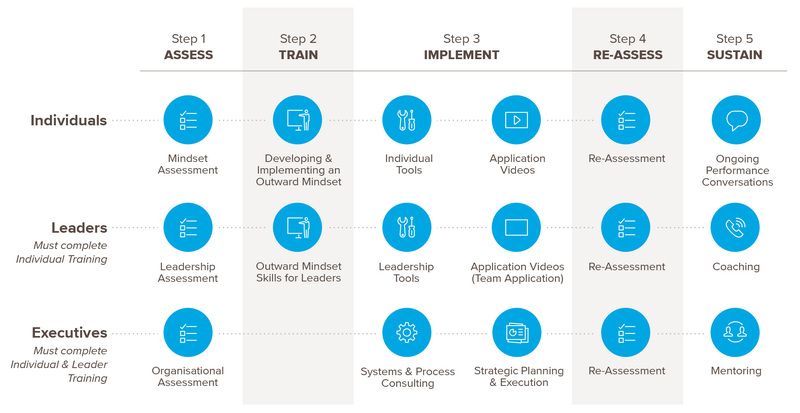 The three tracks—for individuals, leaders, and executives—build on one another to foster the growth of an outward mindset across an organisation.